The new Captiva was launched a couple days back, but the company has not been able to clear the stock of the older Captivas. So, to clear the previous stock and make way for the new facelifted model, the pre-facelift new Captiva is now being offered with a huge discount ofapprox Rs.2 lakh.Previously priced at about Rs. 19.26 lakhs (ex-showroom Mumbai), the older model is now available at discounted price of Rs. 17.26 lakhs only. The facelifted refreshed model of Captiva which was showcased at the New Delhi Auto Expo in January was first expected to arrive in the market in the first quarter of this year, but General Motors pushed the launch date back to sell the older batch of Captiva which were already imported. But a decreasein sales because of market slowdown resulted in less number of the models getting sold than the original anticipation. Only about 88 units were sold between March and May 2012. The new Captiva SUV initially will be made available in the automatic variant only and will be sold along with the older model. The manual transmission versionwill be launched later on, most probably after the stock of 140 of the older models gets sold. The new Captiva has received several tweaks. Handling quality is far better now, suspension is far more settled on the uneven surface and bumps are engrossed with ease. The electronic controlled steering has become more responsive. The front grille design has been changed giving it more Chevy sense. GM is hoping to hit hard on its contenders with this new facelift. The huge grille that the car boasts of now has been able to completely transform its looks and has probably taken care of the biggest weakness that the Chevrolet Captiva has, of not looking much like an SUV. The grille has been designed in two parts, with a thick strip (where the Chevrolet bowtie sits) splitting it. We are now familiar to this signature that most modern Chevys have been provided with. The other changes that are quite interesting include the change in shape given to the air vents at the sides, the window line being adorned with chrome strip and the mirrors housing the turn signals. Its wheel arches have been provided with bigger protective moldings than the previous versions so that it can easily accommodate wheels that range from 17-inch to 19-inch. However, the variant designed for India is only going to make use of 17-inch wheels, in order to match the higher profile of the tyres. 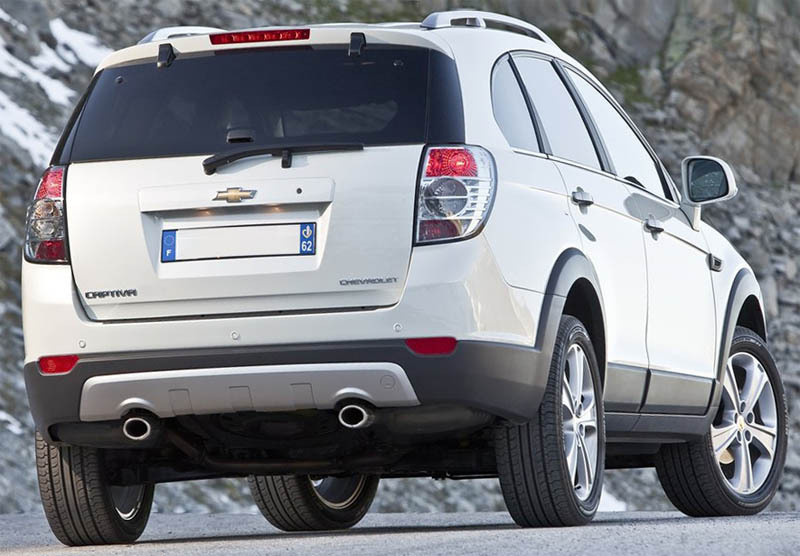 The rear of the Chevrolet Captiva has not been changed. Hence, this portion of the vehicle is least interesting having common lines. 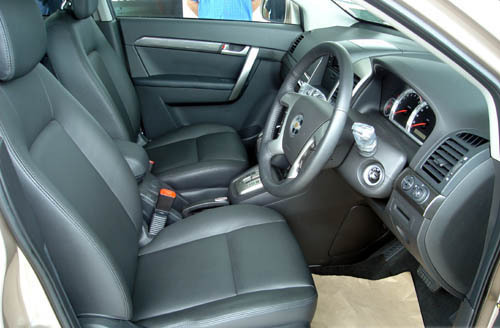 Though most of the interiors have been retained from the previous version, certain clever change in design by GM has resulted in significantly improving the look of the cabin. Its central console has been made much sharper along with significantly improved sculpting. It has been provided with angular vents that has enhanced its sporty look. The seven-inch, large screen functions efficiently especially because there has been an increase in the number of systems of navigation. The option of GPS navigation is likely to be offered by GM India on the higher end variant of the latest Captiva. A completely new instrument cluster has been provided which unlike previous models has offered separate positions to its tachometer and speedometer, thereby ensuring that the data can be easily read. The latest Captiva has been provided with a parking brake that can be electrically operated. This can be operated using a small switch, which has been provided at the base of its central console. 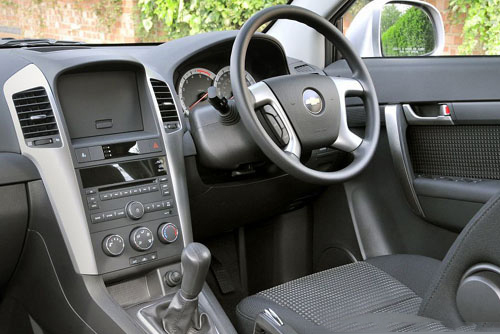 The space that has been generated by the absence of handbrake lever is used by providing two cup holders, which has the provision of being slid below its central armrest. The plastic used is of much improved quality, which generates a more plush feeling than ever before. However, considering that the vehicle has been priced around the Rs.20 Lakh mark generates a feeling that the plastic quality is still not up to the desired standards. Presence of numerous hard and shiny parts makes the cabin loose its ambience quite a bit. However, the switchgear is of a decent standard and the steering as well as gear lever feels better to operate. The level of quality surpasses that of the XUV500, but the Captiva has a long way to go before it can match the standards set by Japanese and European cars. 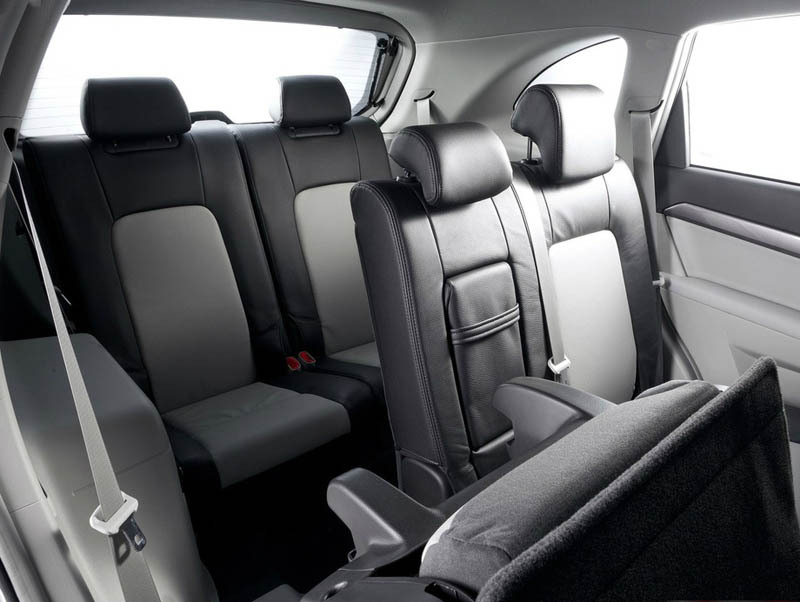 The capacity of the Captiva to comfortably seat seven passengers has been retained, which is an appreciable factor. The middle seat is still spring loaded and can easily be tumbled forward by merely pulling a lever. The third and final row can be made to collapse to the floor for creating a large and spacious area to store luggage. However, if all three seating rows are used, then there is absolutely minimal space for accommodating any luggage. To perfectly compliment the aggressive looks of the car, the latest Captiva has been provided with a 2.2L diesel engine under its hood. The engine has been offered in two tuning states; the lower of the two generates a maximum power of 163Bhp but is restricted to front wheel drive versions. The higher powered variant generates a peak output of 184Bhp and can be used for both two wheel as well as four wheel driving options. The car has been provided with option of six-speed manual as well as automatic transmission gearbox. 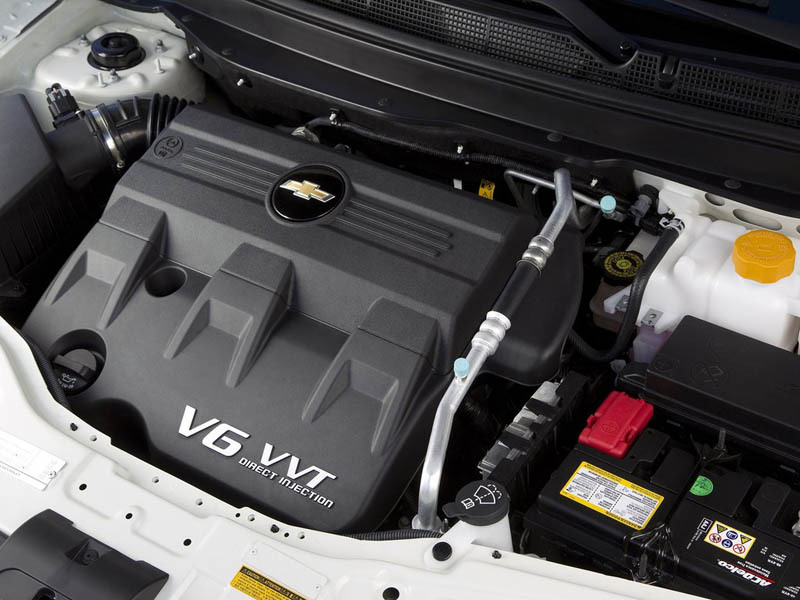 Internationally operating variant of the Chevrolet Captiva has been fitted with the latest V6 3.0L petrol engine and has been given the capacity of generating a maximum power of 258Bhp. Given the high prices of petrol in India and the increasing preference for diesel engine variants, it is highly unlikely that this large petrol engine is going to be offered in the Indian auto market. Though GM is yet to clarify the engine option it is going to provide to the Indian variant of the Captiva, it seems almost certain that the 184Bhp version will be coming to the country. This is going to provide the Captiva with a significantly large increase of power (36Bhp) over its erstwhile variant and more importantly make it overtake the Fortuner (having peak power 168Bhp) while closing the gap with Santa Fe (at 194Bhp). The other admirable aspect is that the engine has increased in refinement and operates at lower noise levels. The sound does not become too prominent even when it is revved very hard. The credit of bringing down the noise and vibration levels has to be given to the dual-mass flywheel, the engine block, which is stiffer and its balance shafts that have been seamlessly integrated to its oil pump. The transmission of the car is a bit of a let down and has not been given the refinement desired. The clutch feels heavy and its dual-mass flywheel cannot ensure smooth engagement of it. The gearshift makes things worse as you need to have very strong muscles to operate it. This contributes to making city driving a tough task on this car. This can be rated in the lower rung amongst gearshifts that are normally provided to SUVs. However, the higher levels of torque on this car as well as improved ratios of its six-speed gear box helps in ensuring that the gearlever is used minimally. The considerable improvement of power in the car can be instantly felt once the accelerator pedal, which comes spring loaded, is floored. Though the vehicle still has some turbo lag, driving becomes smooth once the 1800rpm mark is crossed. The vehicle is also an excellent cruiser with its lower noise levels and tall top gear allowing users to go through highways in relaxed manner. The Captiva has been ideally designed for long drives. If proper usage can be made of its flexible interior, the car can turn out to be an ideal holiday vehicle for you. The chassis of the latest Captiva has also been tweaked to improve dynamics. Even after driving the car for a short distance, one can see that the handling and riding has been improved significantly. The suspension offers a more settled performance particularly on uneven surfaces with bumps being easily absorbed. The steering, which is electronically controlled, has become more responsive but there is scope for further improvement on it. The car still stumbles while taking corners; hence it would be of best interest to not push this vehicle too hard. The latest Captiva has been offered with increased features. Six units of airbags, an improved music system, feature for assisting hill start along with the 4×4 system, on-demand, which converts the car to a rear wheel drive using the electronic clutch, if deemed necessary. This 4×4 system is however best suited for off the road travel. Though the latest Chevrolet Captiva has been provided with a lot of improvements, it still has a long distance to travel to catch up with cars like Santa Fe or for that matter, the higher priced Nissan X-Trail. Hence, in order to ensure that the car catches the pulse of the Indian consumers in a proper manner, GM India needs to price this car in an aggressive manner. The 2010 Chevrolet Captiva in India is a winner as far as its looks are concerned. The Chevrolet bowtie sits proudly atop the two tiered grille. The head lamps are huge rectangular slabs while the fog lamps sit very close to the head lamps signaling its soft roader roots however belying its looks, the Captiva performs better off road than on the road. We will get onto that just a little bit later. The 16 inch alloy wheels have the usual design norm attached to them. The outside rear view mirrors however boast of having the turn indicators embedded in them. The door handles however aren’t body colored and are instead chrome ones. The rear end in the meanwhile is a plain unit unlike the front end. What livens up things is the twin tail pipes, which though, could have been done a bit more tastefully. The tail lamps are more or less shared with the rest of the Chevy brigade in India. Coming to the interiors. They wouldn’t make one go wow the moment you step inside however one thing is for sure. These interiors are hard wearing but at the same time soft to touch. 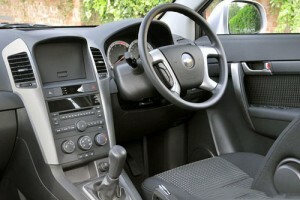 The steering wheel is a 4 piece unit which houses the necessary infotainment controls. For the Xtreme variant, there is the red on black leather seats with sporty red stitchings. There are chrome door handles all around and though the Captiva is a genuine 7 seater, the front and middle row seats make lot of sense rather than the last row. As is to be expected from 7 seater SUVs in India. There are many bottle holders around the cabin as also stowage spaces. The meter dials are also more of functionality rather than outright flash. The gear lever is almost mounted on the dashboard. There is climate control plus an excellent 6 CD changer system. The middle row floor is extremely flat and this liberates lots of space for the middle row passengers. Lots of equipment is on offer including electrically folding heated outside rear view mirrors, electrically adjustable 8 way powered driver seat, chilled glove box, tailgate glass which is remote operated and can be flipped up, flex- seating and also the auto level riding suspension. One of the GM salesman told us that they have removed the chilled glove box option now. When enquired as to why, he said that features are subject to be changed based on GM’s decision. Darn it!. The convenience factor however isn’t lost in this SUV as even with all the seats in place, it can still accommodate about 413 liters of luggage and moreover with the flexi seating arrangement, it is possible to liberate more than 1,100 liters of luggage space. The Chevrolet Captiva in India gets a benign and sort of mushy handling. It can go fast around a corner but that turn would be accompanied by lots of body roll and also a steering wheel which is in its own world. The steering wheel though light wouldn’t actually let you know what the front wheels are upto however an enthusiastic driver would still be able to wring out some fun out of this SUV. This SUV has been setup to provide for a good ride quality. So overall, the Captiva has a pliant ride quality while its handling has been already discussed before. However this cannot be called exactly a soft roader due to the lack of ratio. Instead Chevy have done well enough in providing the automatic variant of this SUV with a fuzzy logic gearbox and Hill Descent Control system with all wheel drive. This all wheel drive works on the basis that when the vehicle senses that the rear wheels are losing out on traction, then it sends more power to them. It is an intelligent unit and hence the Captiva can do some good off-roading as well. NVH is on the lower side and the Captiva engineers have done well in masking the diesel clatter from coming inside the cabin. 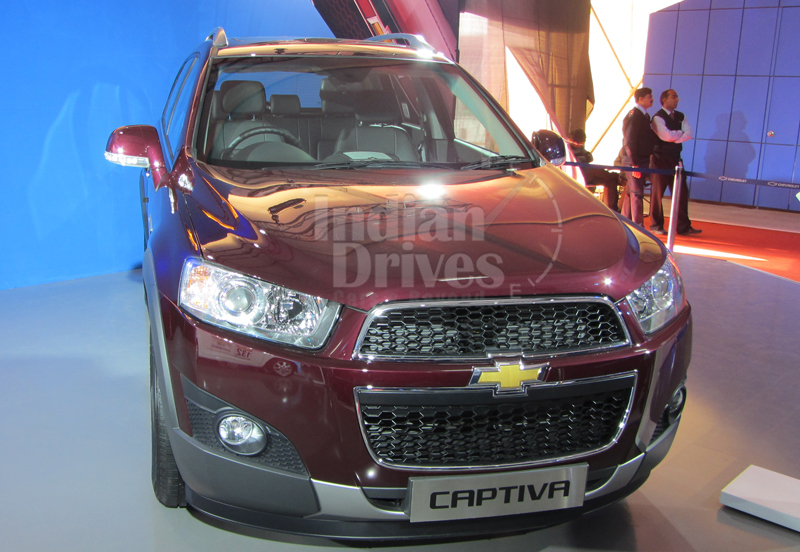 The Chevrolet Captiva in India comes with a 2.0 liter VCDI motor pumping out 150 Bhp of power and 320 Nm of torque. It is mated with either a 5 speed manual gearbox or a 5 speed automatic. The automatic one which we tested had the much applauded fuzzy logic gradient added to its gearbox. While the upshifts were noticeably smooth, the downshifts require some mental calculations to be in place. Moreover this particular gearbox doesn’t shift to a higher gear once its near its redline. Instead it holds on to the particular gear thus allowing for more flexibility. It is said that the automatic dilutes the potency of this motor somewhat however the time that we spent with this SUV, we never felt it that way. Brakes are fantastic and also the tuning for the ABS, EBD and ESP to come into picture. 6 air bags, side intrusion beams, 3 point seat belts and a collapsible steering column take care of the safety aspect. 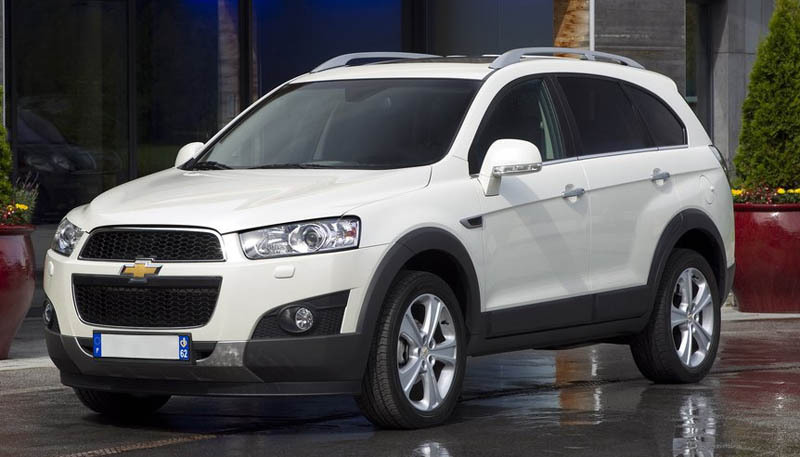 Fuel efficiency however has taken a dent with the Captiva automatic said to return an overall figure of 11.2 kmpl. There are very diesel SUVs available in India within the Rs 20-25 lakhs mark and those include the likes of the Chevrolet Captiva and the Ford Endeavor. While the latter has limited off-road capability in auto mode, the Captiva has some more to keep it going. It is one of the best options as far as automatic diesels go in India. 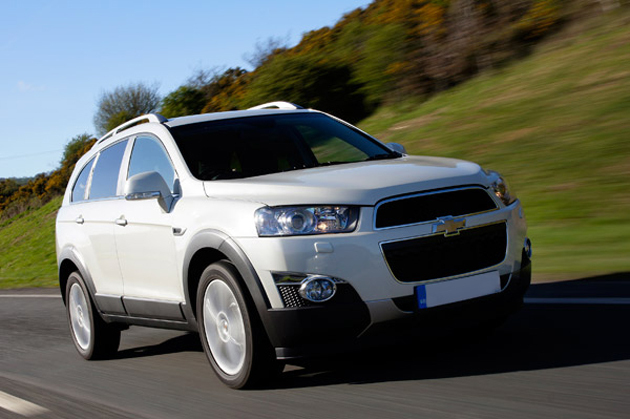 The Chevrolet Captiva price in India starts from Rs 17,994, 95 and goes all the way to Rs 22,81191. 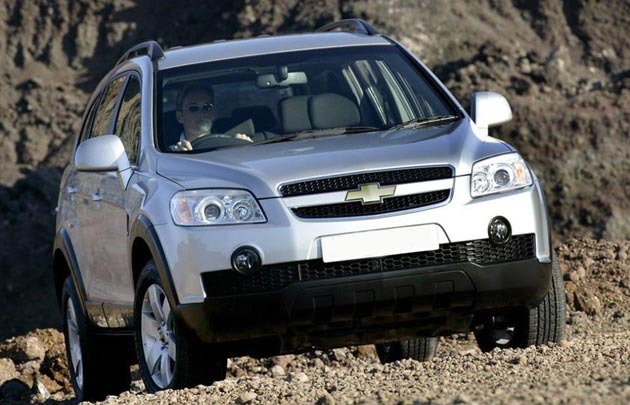 There are three variants of this SUV and those are the Chevrolet Captiva LT VCDi, Chevrolet Captiva LTZ VCDi and the Chevrolet Captiva XTREME. Extremely captivating.